The purpose of a loudspeaker is to move air. The most common system to attain this goal is the electrodynamic driver. All electrodynamic drivers are based on the same concept; A diaphragm (cone) is set in motion by an electromechanical motor system. The speaker gets its motion from a motor system which consists of a magnetic circuit and a voice coil. The voice coil gap is created by the small air space between the top edge of the pole piece and the inside edge of the front plate. Centered within this gap is the voice coil. The voice coil is thin strands of wire wrapped around a voice coil former. The former acts as a support for the voice coil wires, as well as aiding in the thermal transfer from the coil to the pole piece. When a current is passed through the voice coil, the magnetic forces created in the voice coil force the coil to react against the magnetic force in the voice coil gap. The direction of voice coil travel is dependent upon the direction of current flow. The inside edge of the speaker cone is attached to the voice coil former. The cone is the part of the speaker that physically moves the air. The shape, weight and strength of the cone relate directly to the frequency response of the speaker. Covering the voice coil assembly and attached to the speaker cone is the dust cap. This cap exists to keep foreign particles from entering the voice coil area and causing a failure. The shape, weight and strength of the dust cap also relate to the frequency response of the speaker. The spider is attached to the voice coil former and the basket. The spider acts as a centering device and a restoring force for the voice coil. The surround, which acts as an air seal between the cone and the basket, adds to the restoring force of the spider. Another function of the surround, is to absorb cone flexure waves as they are transferred up the cone. The basket is usually made of stamped steel or cast aluminum. Although it does not directly affect the sound of the speaker, it does play a critical role in aligning the voice coil and the magnetic circuit. Speakers with large magnet structures sometimes require the use of cast aluminum baskets. Care should be taken when mounting a speaker so that the basket is not bent, or a rubbing of the voice coil may result, causing failure. Research done in the study of loudspeakers has been conducted by a number of individuals. The works of Neville Thiele and Richard Small are considered to have the most impact on the loudspeaker design field. A method was found, so that one could predict the frequency response performance of a loudspeaker system, based on its physical characteristics. 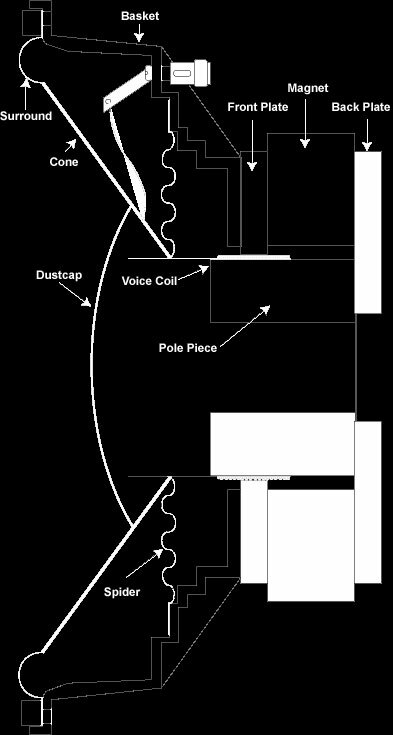 Re - The D.C. resistance of the voice coil measured in Ohms. Sd - The surface area of the speaker’s cone. BL - The magnetic strength of the motor structure. Mms - The total moving mass of the speaker including the small amount of air in front of and behind the cone. Cms - The stiffness of the driver’s suspension. Rms - The losses due to the suspension. By understanding the relationship of these physical parameters and how to change them, we may alter the response parameters to fit the desired goal. Sd - The surface area of the speaker. Fs - The resonant frequency of the speaker. Qes - The electrical “Q” of the speaker. Qms - The mechanical “Q” of the speaker. Qts - The total “Q” of the speaker. Understanding the response parameters allows us to calculate the predicted frequency response of a given speaker system. The formulas that accomplish this are rather lengthy and complex, and are best left to a computer. There are a number of high quality computer programs on the market that automate the design process of building an enclosure. How loud a speaker can play depends on how much air it can move without overheating. How much air can be moved is determined by the surface area of the cone and the excursion capability of the motor system. Xmax is defined as the width of the voice coil that extends beyond the front plate plus 15%. This relates to how far the speaker can move in either direction without appreciable distortion. The amount of power required to move a speaker to its maximum excursion is referred to as the displacement limited power handling. Please note that this number varies with enclosure size and frequency. Loudspeaker power handling ratings are one of the most commonly quoted, but most poorly understood of specifications given by loudspeaker manufacturers. It seems that every company has its own way of measuring and specifying power handling. That’s because Marketing departments are always looking for ways to be able to list higher numbers for power handling in order to impress their customers with the apparent ruggedness of their products. It is sometimes difficult for product users to understand how these specifications relate to real world amplifiers or how they relate to the way they listen to their favorite kinds of music on loudspeaker systems. Loudspeakers fail in one of two ways - mechanically or thermally. Mechanical failures occur when one of the moving parts of the speaker such as the surround, spider, or cone become fatigued, tear, or break from the effects of continued long excursions. Thermal failures occur when the electrical power dissipated in the voice coil as heat causes the adhesives holding the turns of voice coil wire together to break down, or the insulation on the wire to fail, resulting in shorted turns. Also, the wire itself can melt, which means an open voice coil, or the coil support can melt or burn, again meaning failure of the loudspeaker. For many years at MTX, we have been power testing loudspeakers using pink noise band limited from 20 Hz to 20 kHz and crest factor limited to six decibels (four to one peak to average power ratio). Loudspeakers are tested in free air, without an enclosure, for a period of eight hours, and must pass this test without a permanent change in performance characteristics. This is a very conservative test, resulting in realistic power handling ratings, and allows in-house direct comparisons of the power handling characteristics of different models in our various product lines. However, because the speaker is tested in free air without the benefit of an enclosure to add stiffness to the suspension, and the test signal contains full power signals down to 20 Hz, this is very severe mechanically for the driver. Since voice coil excursions must quadruple for every halving of frequency to produce the same acoustic output, surrounds and spiders are quickly stretched to a maximum. As a result, a majority of speaker failures are mechanical, without having stressed the voice coil thermally. Some companies, including MTX, have recognized the need for a better method of testing and rating the power handling of loudspeakers. A committee of members of the EIA have developed a new test signal based on a cross section of the spectral content of recorded music. For several months, power testing at MTX has been done using this new test signal which has been proposed as a “B” revision for the RS-426 standard. The test signal has a flat response from 40 Hz to 1 kHz, with a three decibel per octave rolloff from 1 kHz to 10 kHz, and with a rapid rolloff above 10 kHz and below 40 Hz. In order to encourage its widespread use by loudspeaker manufacturers, the EIA has made the proposed “B” version test signal available on compact disc. The other conditions of the test remain the same as before, the signal being crest factor limited at six decibels, with the driver in free air, for a duration of eight hours. The results of testing loudspeakers in this way has been to stress drivers both mechanically and thermally to nearly the same extent, with a test signal that is a close representation of real music. The power handling ratings that would result give the customer a very good idea of the size of power amplifiers that could be safely used with a given loudspeaker. Because of the excellent testing results which have been obtained using this proposed revision of EIA RS-426, MTX has decided to adopt it as a standard within our company. All power handling ratings published on new loudspeaker products will be based on this internal standard. Since the use of the term “RMS power” is so widespread in our industry, even though its meaning is ambiguous, MTX has decided to continue its use while assigning it a real definition. “RMS power” listed on MTX loudspeaker data sheets will be the power the speaker withstands under the test conditions of the proposed RS-426B standard. In the same way, the term “peak power” has been misused with an even wider variation of so called definitions (or sometimes no definition at all). MTX data sheets will drop the term “peak power” in favor of the phrase “total power” which will be a maximum of four times the “RMS power” rating in order to reflect the amplifier power required to test the speaker under the conditions of the new standard. This is based on the dynamic range of the test signal being limited to a crest factor of six decibels, which corresponds to a power ratio of four times. It is hoped that the adoption of these terms as defined will end some of the confusion about loudspeaker power handling and give our customers useful information to help them in selecting power amplifiers to be used with the speakers in their audio systems. Loudspeaker power handling ratings that have been discussed here are based on standard tests intended to simulate actual use conditions as closely as possible, while still being reasonably practical for the manufacturer to perform. However, customers will typically use drivers in some kind of enclosure, whether it be sealed, vented, or bandpass. The size and type of enclosure will help to determine the mechanical power handling limit of the driver based on its maximum linear displacement. The customer should always determine the power and frequency limitations for his particular driver/enclosure combination before using them with large power amplifiers. Many of the popular computer enclosure design programs can provide this information, or MTX customer service personnel will be glad to help with recommendations for specific drivers and enclosures. A Great Reference for anyone interested in Loudspeaker and Cabinet Design! A Great Technical Reference on Loudspeaker Design written by Loudspeaker Designers from around the globe ISBN: 0240513711 The Purpose of a loudspeaker is to move air. The most common system to attain this goal is the electrodynamic driver. All electrodynamic drivers are based on the same concept; A diaphragm (cone) is set in motion by an electromechanical motor system.